Please see the post on these charts here. 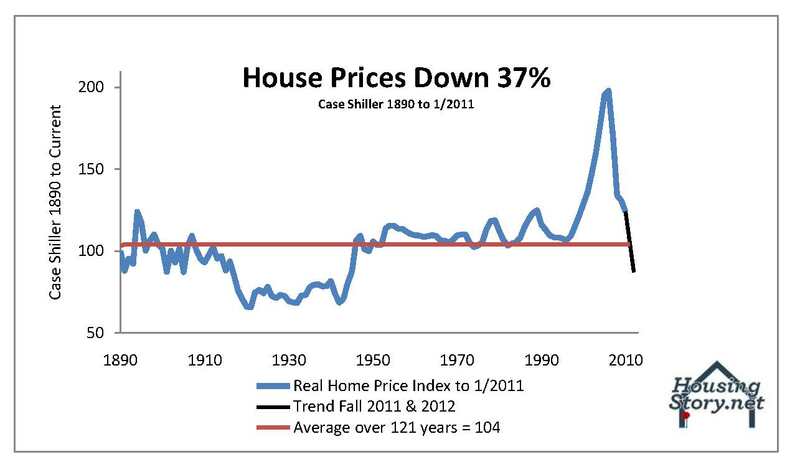 Are houses to be worth less or is it that the currency that they are denominated in to be worth less? I think both houses and the currency will be worth less, and that your charts only assume the former. The shadow inventory shall be sat upon and the federal funds rate will be less than 2% for the next 5 years and it will be stuck at 0% till 2012. As long as banks are allowed to carry the NPA’s on their books for years at a time without M2M they will walk the values down only as fast as their capital levels allow, and banks won’t be distressed sellers flooding the market. 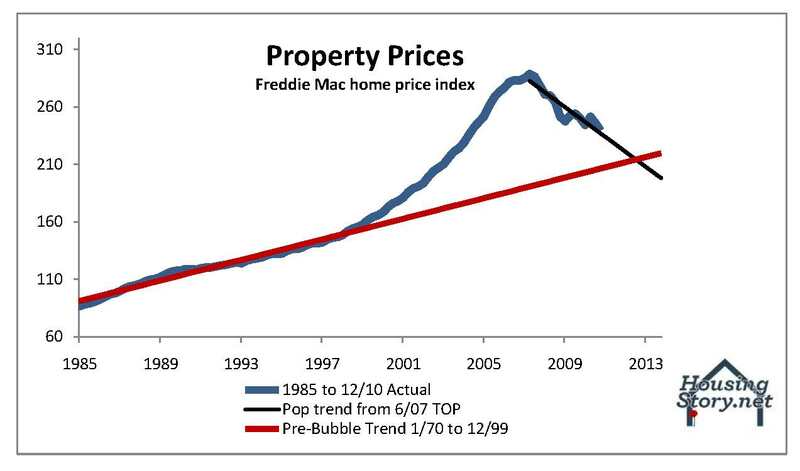 Foreclosures will grind on like Chinese water torture not like Noah’s flood. In this scenario we never get to Z on your charts, and excluding the numbers from California, Arizona, Nevada and Florida, we will experience at most a 10% further correction. Banks must pay property taxes on those NPA, don’t they? Converting them into rentals may be the best option for the banks. 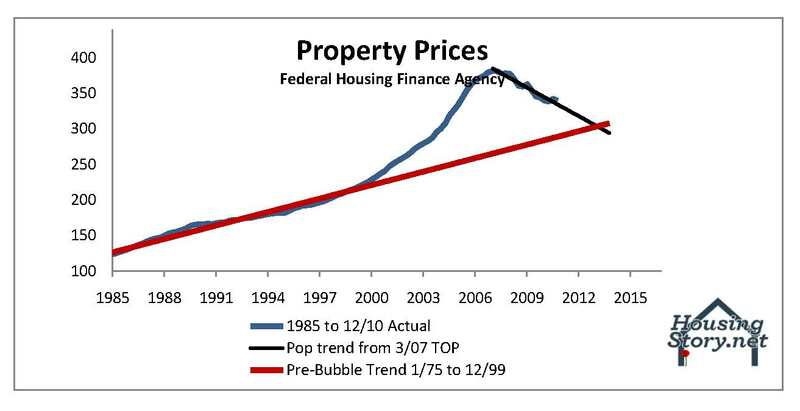 Or else, the Federal Reserve could buy all the NPA and become the country’s biggest landlord. 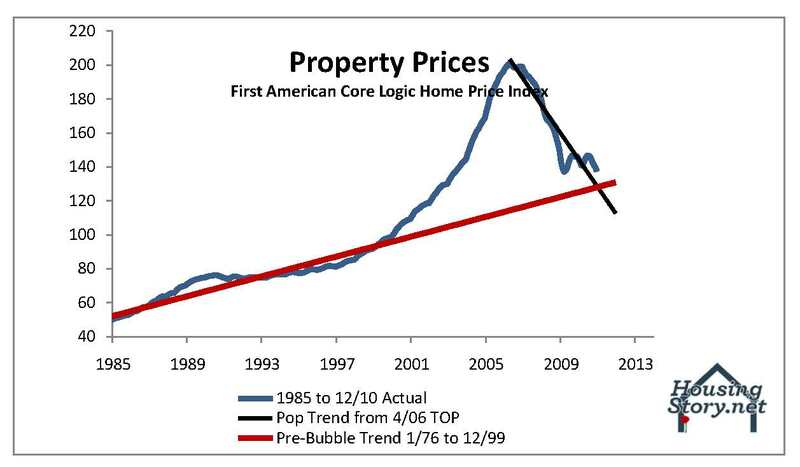 Thank you for the great charts which I would like to use in my residential development class at Cornell University. There is one thing I would like to clarify. 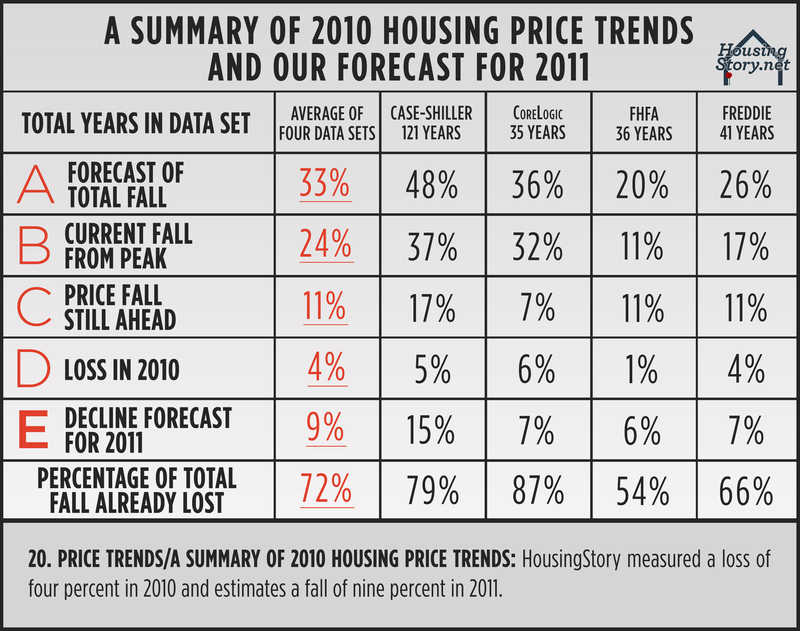 There may be a typo in the date on the first table “A summary of results from major residential-property indexes” I think you mean to have the date as of January 7, 2010 (it says,” . . January 7, 2009″). Similarly, the first graph is data as of January 7, 2020 and I think you mean to have it be January 7, 2010. Great stuff, love the data. Too many people, consumers and industry insiders alike, try to make decisions on real estate without really knowing the numbers behind the trends. Like you, I take the time to really break down market stats, and I use that to help consumers make educated decisions. A nice side effect is that I have developed a reputation with the local paper as the statistical go to guy for real estate trends. To me, data is king. I’m glad I found your blog on Huffington Post, keep it up. Sir, very decent analysis, in deed (no pun intended). It seems impossible to tell the direction based on the forced solvency (TARP et al) and imaginary accounting rules enacted to permit banks to soon-after become solvent and not otherwise liquidated (ever-accumulating) shadow inventory. Please enhance this analysis by examining several metropolitan statistical areas (MSA’s) and identifying some MSA-specific trends so that the amount of salt (or sweetener) we add is more ideal. A fairly well-off suburb (middle class MSA suburb) and an adjacent less-well-off suburb (lower middle/upper lower income) in a state with severe (gamed against one with moderate) budget issues as well as severe (gamed against one with moderate) unemploymnet. Finally, scrub for industries in demise/on the rise in those areas (employment & income trend). The 20% might be palpable under a controlled liquidation schema under recession. However, the 45% seems a bit much, unless no jobs arise and global deflation dominates and causes a true global depression. Regardless, thanks and keep up the good work. The point is its just another ‘next best thing’ to sell. Tulips… property… a little more involved to push property but on the plus side it created jobs. In the grand scheme of things its the same play: pump and dump, make loot shorting the (insert what you got everyone to buy here). I should have bought in 1915. Great site and projections. Here is a fun suggestion for your site; have a survey. I am thinking about having a programmer put this one together for all like minded real estate sites. If I have it done are you willing to post it on your site? 1) Do you believe the executives at the lenders, credit rating agencies and investment banks should be disgorged from their ill gotten gains? 2) Do you believe the executives at the lenders, credit rating agencies and investment banks should be indicted for their roles in this financial crisis? 3) Do you believe our government will ever bring these financial terrorists to justice? 4) Why / Why not? 5) Are you willing to do something about it? 6) If yes, provide email. If no, think about the following. If you have any other questions you think would be good to include let me know. We could use this during the election year and ask that our representatives respond to the findings. Question one assumes 1. all lenders, credit rating agencies and investment bankers are the same. However, they are composed of individuals. Some had insight into the undue level of greed and optimism of the general investing public and into the danger of complacency and failure to understand that high returns are often associated with high risk. Your question assumes all the gains are ill gotten. Or are you going to decide whose are ill gotten and whose are just getting out at the right time? (Might I assume that was before you got out?) We are supposed to punish wrongdoing on a case by case basis, rather than thinking and reacting using broad prejudices. Many astute people sold when they thought values no longer made sense. People often want to blame someone other than themselves for their grief. Question 2. Should they be indicted? All of them, or just those who committed indictable offences? Question 3. Do you think labeling all of them as financial terrorists might be including an assumption in the question which may not be true in every single case for every single executive, but could possibly lead to a biased answer? Do you think that might be a form of prejudice or prejudgment of individuals based on membership in a group? Do you think the question could be more fairly or thoughtfully expressed so as to obtain real information rather than merely demonstrating bias and predisposition? All that is necessary for evil to triumph is for otherwise good people to stop thinking and distinguishing right from wrong and allow themselves to be overtaken by their prejudices against groups.